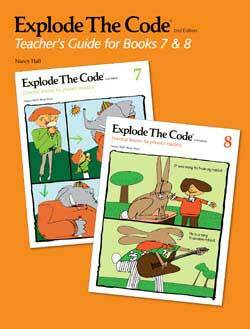 Explode the Code 7-8 Workbooks will supplement any reading program. 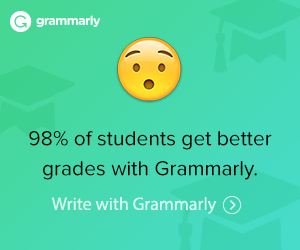 Use after completing Level 6. Levels 7 and 8 have reading comprehension exercises. The Teacher’s Guide 7-8 has lesson plans, teaching suggestions, and answers to the exercises and posttests. Explode the Code 7 Workbook covers soft c and g; ear; words with ei and eigh; silent letters –dge, –mb, kn-, wr-, silent t, silent h, and ph. 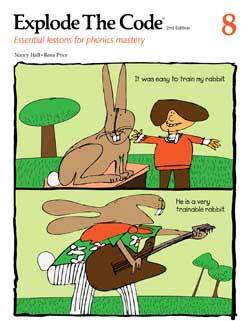 Once your child has passed Books 5 and 6, the reading gets easier. At least that’s the way it was for our children who used the Explode the Code series. The 6 youngest children used them with great success. Workbook 7 adds crossword puzzles and some reading comprehension paragraphs to the activities. Explode the Code 8 Workbook covers common suffixes and endings such as –ness, –less, –ous, –or, –ist, –ity, –ture, –ment, –able, –ible, –sion, –tion, –ance, –ence, –tive, –sive, –ity, –ize, –ti-, and –ci-. 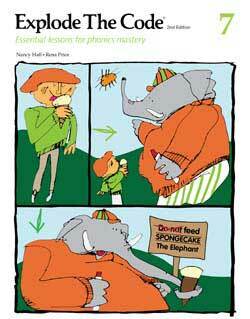 Book 8 has a comprehension reading and activity in every lesson. Even though the child may be able to do most of the exercises in Book 8 with less help than the previous books, it still helps to stay one-on-one as he does the work.